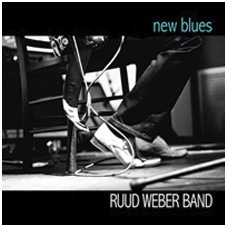 This new CD by Snowy White’s bassman Ruud Weber is a real gem. One of those wonderful discs that you play to the end and then want to play through again, and again. Nothing ground-breaking or demanding – just fine music played by people who enjoy doing what they do and just happen to be very good at it too. Two years ago I enjoyed Snowy White’s show at the Harmonie, but especially the contribution from bass player Ruud Weber. Snowy not being a man for the spotlight, Weber tended to do the shining (unless there was a killer guitar solo going down of course). The Dutchman in the Stetson promised to let me know of his future projects, and thankfully his memory is long because he alerted me to ‘New Blues’. ‘Ruud Weber Band’ is the name on the label and rightly so. Whilst Weber’s bass and especially his vocals are the musical centrepiece of most of the CD (and almost all numbers were penned by him) the ‘Band’ shines too. German guitarist Lars Müller especially delivers some superb melodic guitar phrasing,especially on the two slow Blues numbers ‘Just Another Day’ and ‘I Still See You’. His playing on ‘Move Over Mister’ too is excellent but the closer ‘Take One’ uses it’s jazz structure to allow him to really cruise out in Santana fashion. Drummer Rob Ter Maat also balances firmly between a light touch, as on ‘Take One’ and rocking out, when called for. All the special guests on the CD make good impressions too. Nico Wayne Toussaint’s Harp blowing adds bounce to the already bouncy ‘Can’t Get Enough’ and adds swagger to the already swaggering beat of ‘Colours & Shades’. John Hondorp’s Hammond too is just the right sound in just the right places with a swirling sound on ‘If I Can’t Have You’ and I’m in Hammond Heaven again with his contribution to ‘Move Over Mister’. There’s a guitar contribution from Snowy White on ‘Go Back To Where You Came From’ that needless to say, is right on the button but Müller’s guitar work is so good that if I hadn’t told you where to look you wouldn’t know where Snowy was. As mentioned, It’s Ruud Weber’s bass that powers a large part of the music on this CD. For me though, what impressed me most about the CD is what had impressed me most about the concert two years ago – Weber’s vocal style. He cruises along in Paul Rogers mode with a touch of Coverdale, particularly on ‘Colours & Shades’. Production is excellent throughout with a clear ,roomy, sound that allows every instrument to breathe in its own space which perfectly fits a CD where every musician gets the chance to similarly breathe. All in all, this is an excellent CD that I recommend to Blues lovers everywhere. It’s made by people without ego’s which means, to my ears anyway, that everything is done for the good of the song being recorded. The music in short fits like a glove and it will fit like a glove in my CD player for a long time to come. 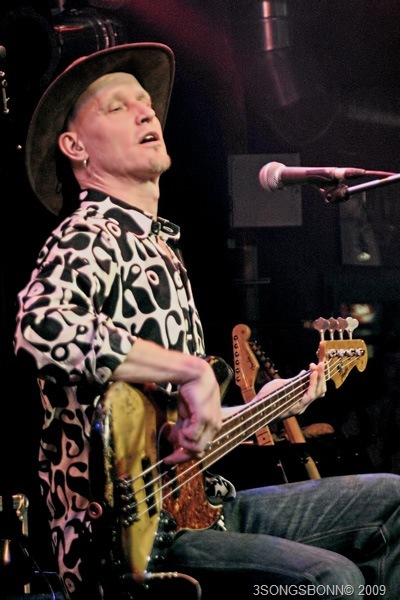 This entry was posted in CD Reviews and tagged new blues, Ruud Weber, Snowy White. Bookmark the permalink.